Pure avobenzone is a whitish to yellowish crystalline powder with a weak odor that is dissolved in isopropanol, decyl oleate, capric acid/caprylic acid triglycerides and other oils. Because it significantly degrades in light, you get less protection over time. Left exposed to sun on an even mildly sunny day can cause it to lose it's effectiveness. (It can lose up to 36% effectiveness in 1 hour.). To minimize its degradation, it is paired with Octocrylene (an organic compound) that is a clear and colorless oily liquid. This compound has two functions: it absorbs UVB and short-wave UVA rays and it makes it water resistant. So, now you know! 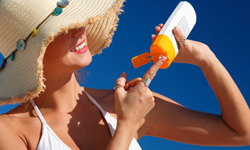 Sunscreen is essential to protect your skin from the sun's harmful rays. It is the major player in preventing signs of aging. Avobenzone = protection from UVA rays! Use it often!